List all countries against their region separated with comma. 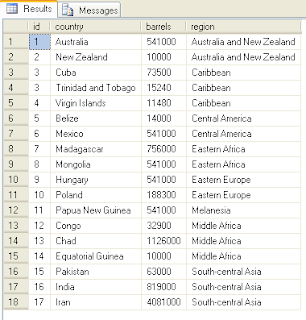 On my free time i found one table which list countries with their region like(Figure-1),they were using simple string base query to put this data as Shown in (Figure-2). All in above query is to List all country against their region separated with comma. And another i will present is written by me and my friend prashant meghvani find out another using new XML Datatype is. you can use to test this method.just copy and paste it in your Query editor.